Kevin is a confident and experienced trainer with a long track record in providing tailor-made training for early years practitioners, primary school teachers, staff and volunteers on arts and community projects and aspiring storytellers. Inservice workshops for nursery teachers, playworkers, childminders and speech and language specialists, and demonstrations and key-note speaking at EY conferences. Primary school INSET days, staff meetings and presentations and key-note speaking for conferences and professional development courses. One-off training sessions and longer-term courses. One-to-one mentoring and group tutoring. Kevin was absolutely brilliant at the Early Years conference and all our colleagues left feeling energised and ready for the term. Storytelling skills – developing skills in the art of oral storytelling. The uses of storytelling – exploring the pivotal role that stories can play in the acquisition of language and literacy. 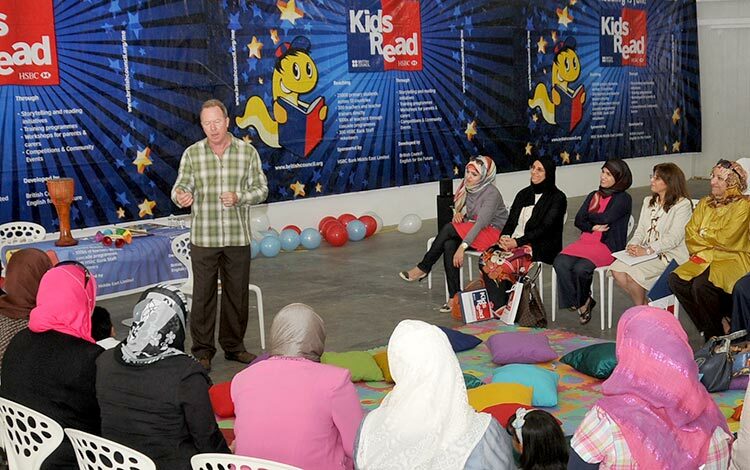 Not only did the children benefit from Kevin’s obvious love for literature and his dynamic and enthusiastic approach, but the teachers agree that they too found his sessions inspiring, stimulating and a valuable contribution to their own professional development – excellent inservice training. Down to earth and refreshingly free of jargon, Kevin’s training sessions will improve your self-confidence, unlock your creativity and - above all - leave you with lots of practical ideas. Lots of really good ideas for 'playing' with stories through songs, rhythm and drama. Kevin’s track record as a trainer is distinguished and wide-ranging: from lively presentations for after-school staff meetings and INSET days in UK schools to demonstrations for English Language teachers as part of the British Council's teacher-training programmes in the Middle East; from mentoring Lloyds of London volunteers on a reading partners scheme in inner city schools to workshops at a conference of literacy professionals hosted by the British Library. Whatever the objective, all of Kevin’s training is delivered with clarity and good humour. His focus is always on useful ideas that are relevant to real-life situations and give participants fresh insights and new perspectives on the ancient art of storytelling. Kevin’s training workshops on ‘Bringing a Story to Life’ have inspired our English Language teachers to be more creative in their teaching and given them new found confidence in their storytelling.